Carolyn “Jane” Goeckler was born August 17, 1929 in Wamego, Kansas. The eldest of 4 children born to Hugh and Caroline Miracle, she is preceded in death by her parents, her son Rick Puckett, her brother Ross Miracle and her sister Sally Ubel. Jane was a woman of many interests. She loved music (especially the crooners of the 40’s and 50’s), reading, travel, and basketball. She had a deep and abiding faith that saw her through many trials in life and was a committed teacher of the Word for many years, teaching Sunday school classes and Bible studies whenever asked. In 1960, while singing in the choir at Trinity Presbyterian Church in Manhattan, she met “the man of her dreams”, her second husband, Donald Goeckler. They were married on January 27, 1962 at the Presbyterian Church in Wamego, KS. 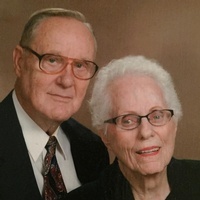 Jane passed away on January 20, 2019, one week before their 57th wedding anniversary. Jane was an avid reader, once describing herself as a book addict who needed to always have at least two books nearby. One to read and one to start when the current story was finished! She and Donald loved camping and logged many miles in their trusty motor home. Over the years they covered most of the continental United States except for a few states in the North Eastern and the South Western parts of the country. Their fondest memories were of their years as “snowbirds” when they would spend the months of November – April in New Braunfels, TX, their home away from home. It was during their years in New Braunfels that the couple became avid fans of the San Antonio Spurs. After many years as basketball season ticket holders for “her K-State Wildcats”, Jane and Donald were dismayed that very few games were available for viewing while in Texas. Enter the Spurs, and a new infatuation for them both. Throughout their years together, Jane and Donald were very involved in their church and community service. However, her greatest legacy is the founding of the Silver Lake Library. In April 1974, she and a small group of women from the Silver Lake Methodist church organized a book drive and obtained a small space to begin a town library staffed by all volunteers and filled with nothing but donated books. Although she had no formal education after high school, her passion for books and a lifelong interest in learning, coupled with her organizational skills, drove her to learn everything she could about developing the library into a fully funded public service to her community with a paid staff. After her retirement in 1989 she continued at the library as she began, volunteering to do odd jobs as needed. In recent days, Jane has been described as strong, feisty, classy, passionate, independent, loving and outspoken. Her family would say that she was all of these and more. She will be sorely missed as a woman who was ahead of her time and larger than life. Jane is survived by her husband, Donald Goeckler of Topeka, KS; her daughters, Lee Puckett of Topeka; Lu (Rick) Hefner of Overland Park and Donna (Kim) Goeckler of Olathe; a son, Danny Goeckler of Topeka; a sister, Madge McDonald of Wamego; as well as numerous grandchildren and great grand-children. Per Jane’s wish there will be no memorial service. Donations may be made to the Silver Lake Library for their building renovation fund, and sent to Brennan-Mathena Funeral Home, 800 SW 6th Ave., Topeka, Kansas, 66603.